Art Link doesn’t need a lot to motivate him. “We were eighth in the country two years ago on third down [defense] and last last year,” Lafayette’s defensive coordinator said Saturday following the 13th of 15 spring football practices in Fisher Stadium. For the record, opposing teams converted 90 of 159 third-down plays (57 percent) to first downs – and sometimes touchdowns – in 2016, and that weakness contributed a lot to Lafayette’s 1-10 final record. The previous year, in which the Leopards were 5-6, opponents converted 48 of 162 third-down attempts (30 percent). Injuries were critical. I remember senior Chris Brockman telling me at Lafayette's media day in July that “five-and-six isn’t good enough.” The 225-pound linebacker was coming off a junior year in which he was No. 2 on the team in tackles with 77, including three sacks and seven tackles for loss. He was a perfect fit at the “Strike” position – a hybrid linebacker-defensive back – in Link’s 4-2-5 alignment. But Brockman suffered a foot injury before the season ever started and didn’t play a single down all year. Then, in the season opener, another key component in the defense, safety Draeland James, suffered a leg fracture. Beau Bosch works on a fumble-recovery drill. Those two early losses were just the tip of the iceberg before the season ended. The secondary, which was touted as among the best in the league preseason, was devastated. Five different players started games at free safety and also at one cornerback spot, and not a single player was able to start all 11 games. The problems were never more evident than in the third-down situations. Two of the projected 2016 starters in the secondary – rising sophomore Kaizer Butler at free safety and rising senior James at strong safety – have been in “blue” practice jerseys during the spring camp, but because of a change in format, they have been a lot more active in the 11-on-11 drills than they would have been under the former full-pads system. And Link likes what he has seen. Powe came to Lafayette as a 185-pound linebacker. He was a starter in six games, at three different positions, as a freshman. The last three were at “Strike.” He has really benefited from Brad Potts’ strength and conditioning regimen and is now at 210 pounds. He, along with linebackers Root (235) and Brandon Bryant (225) have the makings of a solid group in the center of that Lafayette defense. The defensive guys had a good time on Saturday. Bryant, who I think has to be as good as any linebacker in the Patriot League, was running around and cheering on his buddies when he wasn't on the field. And, some of the interior linemen seemed to be able to hold their ground in battles with the offense. If Link has been happy with the way things have gone this spring, so has Lafayette’s offensive coordinator, Mickey Fein. Drew Reed and Blake Searfoss are pushing one another at quarterback. Of course, any conversation with Fein is likely to begin with a discussion about the quarterback spot, and the former record-setting University of Maine QB seems happy to have the responsibility of choosing between a pair of seniors, Drew Reed and Blake Searfoss. Saturday’s practice included three periods of 11-on-11, and while there was no tackling, the presence of officials gave those periods a good football feel. The running game is hard to assess under these conditions, but DeSean Brown, C.J. Amill, Rahjan Meriwether and Tyler West all got some work. 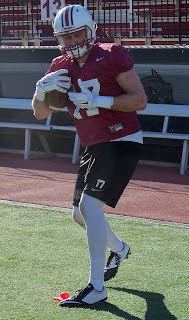 Searfoss had a pair of “touchdown” passes during the “live” portion of the practice – one a 32-yarder to 6-4 Matt Mrazek and the other a 40-yarder to converted quarterback Josh Davis, who’s been at wide receiver less than two weeks. But later, Searfoss made a bad read and was picked off by Butler in one of the big plays of the day for the defense. Mrazek missed the last three games last year with a broken collarbone but still led the team in receptions. He has great hands and reminds me more and more of former record-setter Mark Ross. He seems to use his body in much the same way Ross did for two great years. Tim Vangeles, who missed the first five games last year with an injury, seems to be rounding into 2014 shape. He was the second leading receiver that season even though he started only six games. Davis came up limping at the end of his athletic catch but received lots of kudos from other WRs, who seem to have invited him into their club without reservations. The offensive line was down in numbers on Saturday, but Fein said of the group’s improvement, “We’re not all the way there yet, but we have some guys who are learning on the fly and some kids who haven’t played a lot of football are playing a ton in the spring and they’re getting better. I’m excited about all of that. “We still have some stuff we have to know about and we’ll find out in fall camp, some smashing stuff with the tight ends, particularly. Can we smash with those guys? That’s something you can’t really find out about now. A future Quilling at QB? EXTRA POINTS – Head coach Frank Tavani said 162 high school junior prospects and their families visited practice a week ago. They filled a couple of sections of the visitors’ grandstand, and Tavani said he had to address the group via microphone from field level. … More than a dozen members of the 2016 recruiting class were at Saturday’s practice, and Tavani spoke with them briefly after it ended. Not all of the visitors were locals, either. 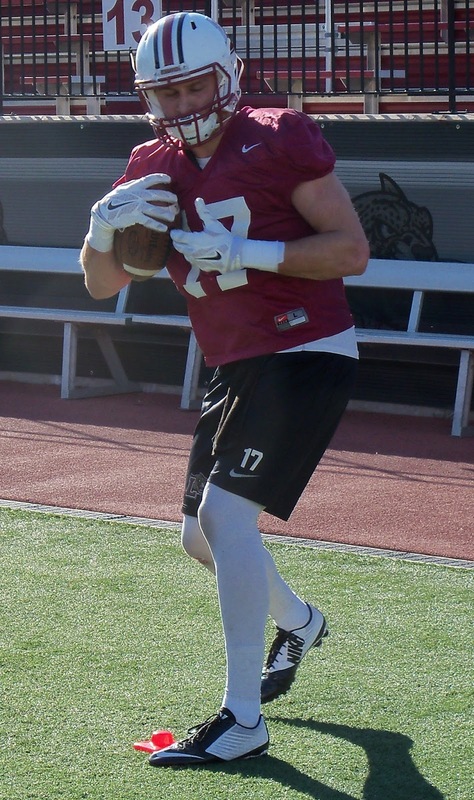 I spoke for some time with Patrick and Catherine Nelson, whose 6-8, 270-pound tight-end son David will give the Leopards a bit more Tennessee flavor – he’s from Memphis, and Reed is from Lakeland, Tenn., in the same area. Nelson was a highly recruited basketball player before he decided after his junior year of high school that he wanted to concentrate on football. He has the size and athleticism and will bear watching … There will be a shift in emphasis for the final two spring practices. For the first time, the Leopards will devote some spring-camp time to the year’s opening-night opponent, Central Connecticut State. The meeting on Friday, Sept. 2, will be the first ever between the two teams. Lafayette was originally scheduled to practice on Tuesday and Thursday, but because of a scheduling conflict, the Thursday practice has been moved up to Wednesday. จีคลับ A casino site that provides gambling investors with a full bet. Played very well Gambling is live from the real casino. Bring it to everyone to play it realistically. There are many investments. Make huge profits. Where is the fun? Bet on it every day, like a new gambling fun every day. Betting to help players meet the first chance to win. Play casino games anywhere and anytime. It is ready to play the luck as anyone can play well.